Wow... something I've heard of before. I was actually thinking about these the other day. Those girls never cease to amaze me. Kirsten, you really should take a look at the cat with four ears thing I sent you. It's amazing!!!! Lol I heard about that. Pretty awesome how everyone believed them! I have heard that story, I've actually seen a movie based on that story. Anonymous: Believe it or not, I do to. 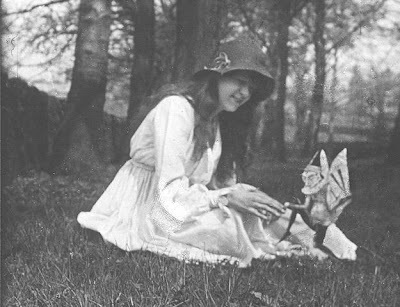 I have seen a few fairies before. What a cool, cool story. same as liltomboyblue, i saw that movie... and a fairy, once. Those girls took another photo too, and they always said it was the only real one. I LOVE FAERIES!!!! I believe in them one hundred %. hey commenters? 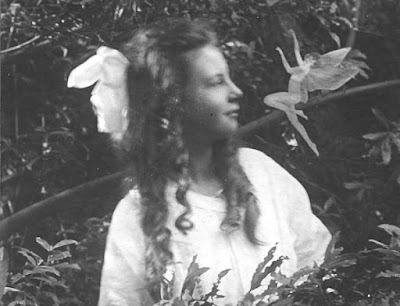 do you think being able to see ghosts is related w/ being able to see faeries? cuz liltomboyblue11;) has seen ghosts AND faeries, whereas i wholy believe in both and yet have never seen either. K( i certaintly hope not, i would love to be accepted into the world of faeries. and i wouldn't mind meeting a harmless ghost, although if i get to see (since i dont know how to be acquainted with such a 'person')than i dont really think i have much choice in whether it was harmless or not... hmm... i think liltomboyblue11;) is very lucky indeed.what do you guys think? about my earlier question on the relationship between being able to see such sights? after i read this, i did some editional research of my own. I guess there wasn't that much to actually learn more about, since the summary was pretty thourough, but i was really mad at a specific site that was marveling over how "little girls" fooled the world. WHAT DO THEY HAVE AGAINST SMALL PEOPLE??? AND GIRLS, TOO??? I belive they were telling the truth. They were two young girls who held to their stories for a very long time. The same stories, If it wasnt true I dont think they could of held to the same stories without slipping up. I feel they were just pressured and tired so they said what they had to just to be left alone when they confessed. 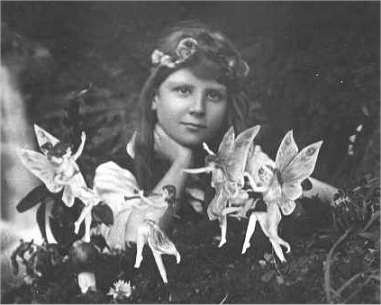 And in one article I read that one girl insisted that their really was fairies and that the fifth photograph really was real. Why Lie About the fifth one and confess to the others. I dont think we'll ever really know but either way if you think about it they gave the world hope and something good to believe in. Thats something the world needs now. I wish I knew what made them say the pictures werent real [I dont believe either ever said the faries werent real just the pics] I wish they would of just kept up their stories and never told otherwise. I believe and always will!